Oil drop lubricated rotary vane vacuum pumps with adjustable drippers and air cooling. 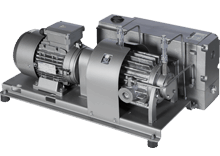 Designed for medium vacuums, used in the chemical industry and for the thermoforming of plastics. 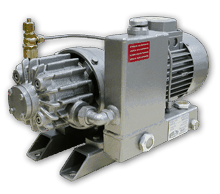 The versions with total loss oil lubrication are used in heavy industrial processes, where the continuous lubrication of fresh oil protects the pump’s internal parts. Cast iron pumping unit coupled directly to the electric motor via an elastic coupler. Oil tank with capillaries and adjustable lubrication drippers. Steel oil/air separator eliminates oil mist discharge, air cooling. Cast iron pumping unit coupled directly to the electric motor via an elastic coupler. Oil tank with capillaries and adjustable lubrication drippers. Aluminium oil/air separator with cartridge eliminates oil mist discharge, air cooling.